Vedacharya is a Tilism expert and Bharti's grandfather. He is blind but can see people by the energy they emit as rays. He appears in many issues and is often seen helping and protecting Nagraj and other snakes on Nagdweep. He was the personal astrologer for King Takshakraj who was the father of Nagraj and was killed by Nagpasha. Vedacharya is the one who convinced Nagraj to live in Mahanagar and gave him his alter ego Raj. 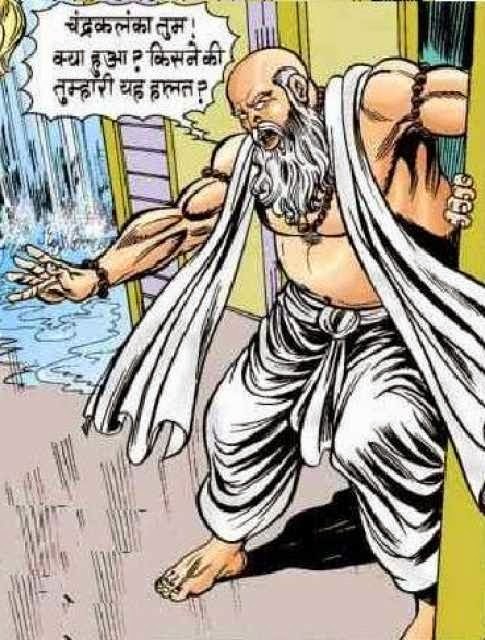 Vedacharya has created many powerful tilisms, but the most noteworthy of them is the Tilism you find in the Khazana series where he created a Tilism with co-operation of Dev Kaljai, the diety of Nagraj's family for protecting the family treasure from falling into the hands on Nagpasha. It was designed in such a way that only the son of Takshakraj can break it. His strong character with his knowledge inspired me to learn more and someday become as knowledgeable and wise as he was. Blind but still extremely powerful and wise, Vedacharya impressed me with his wisdom. Often helping Nagraj, he is a memorable character in the Nagraj series. Come back again to checkout my next favourite Indian cartoon/comics character whose name starts with W!